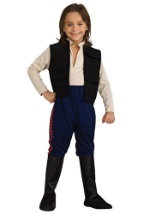 The little Tatooine native jumps off the screen and into our galaxy this Halloween when your child goes as a Jawa! 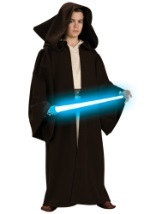 The licensed costume consists of a full-length robe that is made from brown polyester. It Velcros in the back for closure and has shredded edges along the sleeves and bottom. The poly foam shoulder straps have molded pockets and are secured in place with Velcro on the shoulders and hips. The Jawa hood is also brown with the face covered in black mesh. A plastic visor lines the hood underneath and contains light-up eyes, which turn on with the easy switch of a button. The light-up eyes are orange and batteries are included. 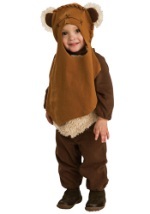 Now you can be the classic Star Wars character when you go as this Jawa!